Could figure out the expected value with some additional info. My other question is: how is this not an illegal lottery? How many days of cleanliness could you get out of this bar of soap? How many days of sudsy clean do we lose with the money inside? I’m not real keen on rubbing dirty money on myself, even if it’s been sitting inside a bar of soap. If it cost $10 and the bar contained the $20 or $50, how many regular bars of glycerin soap would that afford me? So I think I’m saying both, but what I really want to have happen is some market research, so that they find out just how close the margins are, and how easy it is to get fooled. Your friend Dan walks in with 5 money ducks. Each of the ducks has some money hidden inside – one has $1, one has $5, one has $10, one has $20, and one has $50. You do not know which duck has what amount of money, but Dan does. (1) You pick any of the ducks you want and get to keep the money inside of it. How much money do you expect to win playing this game one time? (2) You pick any of the ducks you want and then Dan tells you the lowest amount of money remaining in one of the 4 ducks that you didn’t pick (without telling you which one of the ducks contains that lowest amount of money). He then lets you pick a new duck if you want. Would you rather play this game or game (1)? Why? (3) Same as (2), but after your first selection Dan tells you the highest amount of money that remains in one of the four ducks that you didn’t select instead of the lowest. He then lets you pick a new duck if you want. Would you rather play this game or game (2)? Why? Depending on how advanced the students are, you could ask for expected values in games (2) and (3), too, but even without calculating an exact number, the discussion about which games people would rather play would be interesting. I’d set up many sets of two types of groups, producers (sellers) and consumers (buyers). The producers would determine what distribution of the bills (ha) go in the ducks and then set a price based on that info. They make up 20 “ducks” with their distribution. The consumers would go up to a producer and be given the odds of each type of bill and the price of the duck. It’d be up to them if they’d like to buy that groups ducks. The consumers would have a limited amount of cash to start with so they wouldn’t be able to buy out a producer. If they don’t like the offer from one of the producers, then they could take their business elsewhere. Producers can change their prices based on their competition (but not change the distribution odds of the bills). Alas all so many good ideas already! You, your friend Dan and 3 other friends each have a Money Duck. Dan finds out his has a 1$ bill (sorry Dan). One friend then asks you to switch ducks with them. Should you? (Easiest variation – 5 ducks, 5 prizes as indicated on the packaging). Wondering what to do with the kids who think you should bust it open in the store to see which one you want to buy. This is a really good expected outcome scenario that could be explored in a multitude of different ways. I would look into the overall cost of production of the duck – materials, manufacturing, packaging, distribution and the money prize, compared with the actual price asked for the duck. From this students could create different distributions of money prizes that still makes the product profitable to the company. The Math Forum has a couple of game of chance problems in which we state, “you are operating a carnival…” We always have kids who have a really, really hard time getting past “is this fair for the player?” They can’t think about what the seller would do at first because they can’t figure out if/why anyone would actually buy the product. And then once they’ve figured out if it’s fair for them as a buyer, they’re not very interested in thinking again/more from the seller’s point of view, because they were often the kids who were least confident & comfortable with the math in the first place. I like the idea of explicitly dividing the class into buyers and sellers, or analyzing as buyers first and then doing market research to think about what the sellers might be able to get away with, because in both cases you make really explicit the differences between the two roles and the different kinds of thinking they get to do, which might help students think about the problem from the more novel point of view. Or even having everyone do the buyer analysis, and then a smaller group who is still interested doing seller analysis, and then pitching their pricing scheme to the buyers who critique and analyze the pitches. The buyers, your less confident math students, still engage twice with the problem, and at a higher level the second time, but have to do less number crunching and get to do it from a role they’re more comfortable in, maybe. Say every student of mine bought just one Money Duck and we pooled the hidden duck money together. Would my students be willing to evenly divide the hidden money (profit or loss)? At what point in the process should they commit to their decision? As a generalist I’d like them to determine if the product constitutes gambling as defined by their home state. As a programmer I’d like to introduce them to Monte Carlo methods and have them code up a simulator. As a businessman/marketer/nanny I’d like them to understand gambling addiction: what payout schemes get people hooked into believing the next bar of soap will get them a Ulysses. btw, does the packaging state the odds for each payout? The actual cost of the product on Amazon.com is $9.94 plus $4.99 shipping. Would it be 1 prize for every 5 ducks? 10 ducks? OR does the response to the survey depend on the price of the duck. After the survey is designed, undertaken, represented and analysed, then do the buyer seller analysis, exploring all the financial maths associated with it. I think I might do this! My 2nd grader wants to know how many baths he has to take before he gets to the money. I’m just curious to know how many people (excluding math teachers, of course!!) have bought this product, knowing it’s priced 15$ in Amazon…. …and more: what is the cost of the soap itself? how could students calculate its volume? I’d split the class in half and have half the class discuss one question and then the other half discuss the other. Then I’d have kids share what their groups came up with. You could break kids up into smaller groups within the halves and then do a “jigsaw activity” where groups them split off into new groups and come together to discuss. I think the question of an agreeable equilibrium is interesting and deep here. Let’s say each payout has a 20% chance, meaning the expected value of the payout is 86/5 = $17.20. So, if you’re going by the long run, the seller may say that’s a fair break-even price based on the mean. Ask students why a buyer may find this unfair. After all, at this price you lose money more than half the time, so $10 (the median) might be fair since you lose money in two cases, win in two cases, and break even in two cases. How would your opinion as a buyer change if one of the payouts was raised to $86 and all the other Money Ducks were empty? I really like Max’s idea of pitting buyers against sellers; then you could use the different buyers’ acceptances or rejections of offers to examine who in the class is risk-averse and who is risk-seeking. A ring worth $10-$5,000 in every candle (purchase cost: $24.95). Nothing to add to the awesome suggestions above. I am expecting an Act III that involves a ridiculous amount of high speed hand washing. They have some more regular shaped bars available online as well. I would want to explore the rate of decay of the soap (more consistent with a regular shaped bar than a duck) compared to its size. Take regular measurements after a week of use, graph, fit appropriate trend and extrapolate to see how long until the money is reached. Could look at how it varies with the shape of the bar (ie duck vs a prism). Students would need to make several assumptions/simplifications which would need to be made to make the problem do-able. I do a similar exercise with my year 11’s where we look at the rate of decay of a Jawbreaker/All Day Sucker, stating hypothesis(relationships between dimensions and rate of decay), measuring its dimensions every 2 minutes, graphing, fitting trend lines, using derivatives and graphs to test our hypothesis, stating assumptions and their effects. We also extrapolate our models to see how big an all day sucker would need to be to in fact last “all day”. My first instinct is that students will be more interested in taking the buyer’s point of view, but some entrepreneurial souls may jump on the question from the seller’s point of view. I like the suggestions to split the class and do the problem from both perspectives. 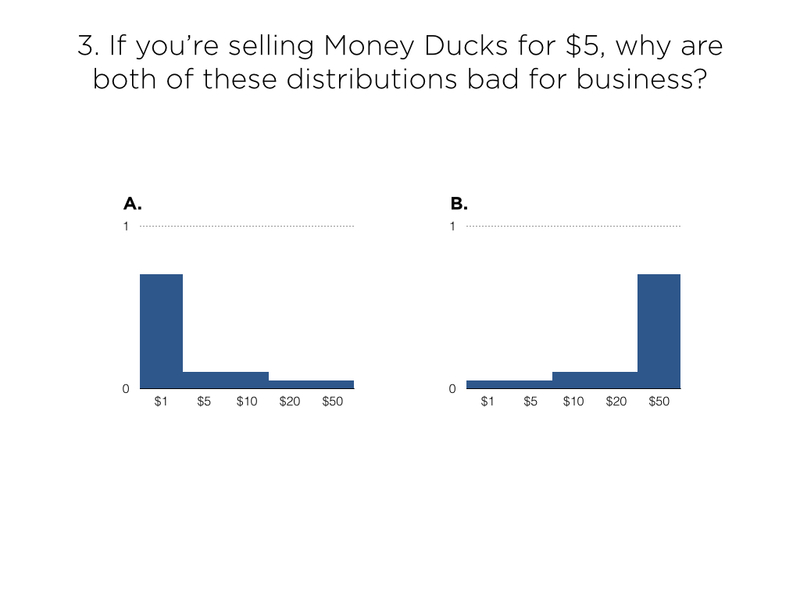 When thinking about the question from the buyer’s perspective, I’d want to know the distribution of currencies in the ducks. In real life, that information is probably not knowable (as the buyer). 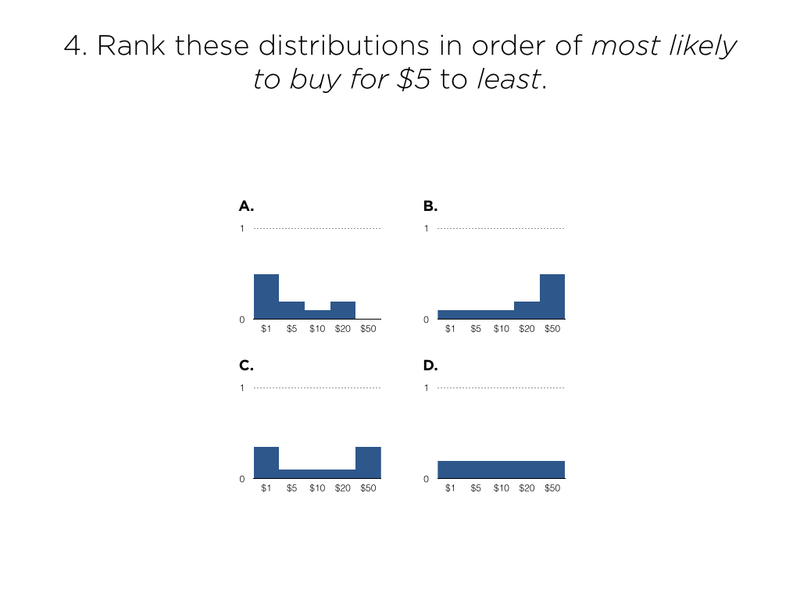 But for the sake of designing a math problem you could either 1) provide a distribution if the students determine its necessary or 2) have them guess what they think the distribution is likely to be (which is what a real buyer must do). 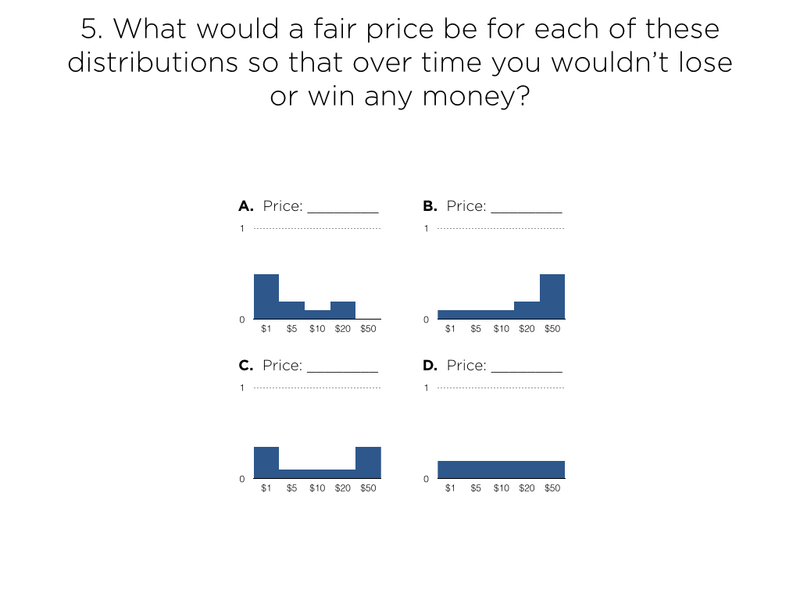 And then they could answer the question–Is it worth it?–allowing and encouraging students to put a value on the soap, the expected value of the currency, and its novelty. From the seller’s perspective, I might flip the question around. A seller would likely come up with a price first that they think buyers would find reasonable (let’s say $10) and then determine the distribution from there. This kind of problem is so open-ended that you might have to put some constraints on it. Say, in a lot of 200 ducks, how many of each bill would you use? And then ask students to come up with 3 different distributions. One distribution would have to equal $10, the second distribution would have to yield the highest profits for the company, and the third distribution would strike a balance between the two and offer buyers some hope of landing that $20 or $50 (which would encourage more sales). As ‘buyers’ we look at a price and decide if it is worth us buying it. For example, if the duck were sold for $20, would that be greater than the expected value of the money? Sellers have more interesting questions to ask, one of which is ‘what prices result in me making a profit?’ Rather than be faced with a price, they set the price, which is a question that requires more analysis. In terms of actually delivering the lesson, I think you start with the picture, and tell kids that they own an unopened money duck. Then, ask them how much they think it’s worth. Force them to ask you what they need to know; their questions will be how much money is in it and how much soap is in it. 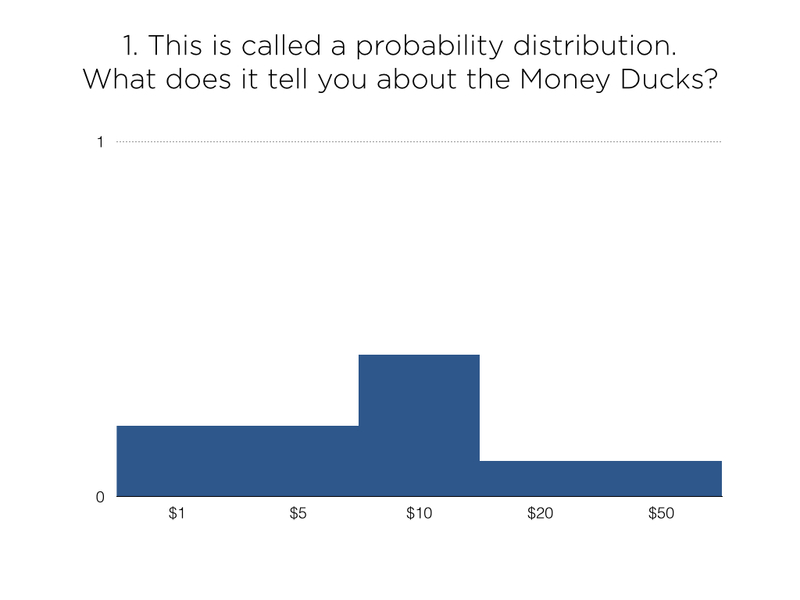 Rather than give the probabilities of the various $ combinations, show them a picture with 100 ducks and the amount of money in each one. Many great ideas here! Taking a spin on M Ruppel’s idea about giving them a pictoral representation of 100 ducks with their payouts, it could be neat to give the “sellers” a piece of paper that has ~50 small pictures of ducks. They are told that every duck must have a $1, 5, 10, 20, or 50 in it; and that each duck costs $2 to produce. Their task is decide how many of each bill to use, and then to decide the individual selling price along with a marketing campaign to lure the “buyers” to choose their product. They can write the dollar amount payouts on each duck as a very concrete representation of how much money they are giving away in total. In the end, the different “seller” groups could present their selling price and marketing campaign, and also their expected profit. 1) Owning and playing aren’t binary, and kids understand this but at 16:40, the teacher doesn’t acknowledge it. Like Mr. K suggested, after setting a price we don’t just want to ask, “Would you buy this?” but also, “How many of your classmates would buy this?” then find out. This starts us down the path of mean v. median v. mode , right skew, utility, and gambler’s fallacy, for instance. Kids can craft a game that balances popularity/appeal among their peers with profits better than I. 2) Feedback! After #1, rip open 10 ducks then ask students to come up with a better price or distribution. How? Either simulate in Excel or build a $10 quincunx , placing dollar values at the bottom. 3) Set up shop like Dan Anderson suggested. Two groups of producers sell ducks while four groups of consumers decide how many from each producer to buy, if any. Stop along halfway through to balance the books, write Yelp reviews, and adjust schemes. When considering the seller’s point of view, I think it’s important for the students to not only consider the price at which to sell the product, but also to come up with ratios stating how many of each bill are used. For example, they could state a 20:1 ratio for $1 and $5 bills. For every 20 bars that have a $1 bill there is 1 bar that has a $5 bill. Thanks for starting this conversation! I would love to use this activity in my classroom! 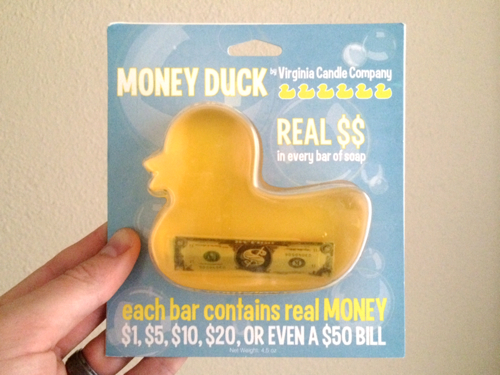 Would you buy if you knew that at least 15 of the ducks had $10 and some contained nothing? If the average amount per duck stays the same, at what point does the possible payoff make the situation more tempting? Thanks for the comments, everybody. The more enthusiastic this crowd gets in a given confab, the harder it can be to synthesize the feedback, some of which is mutually exclusive. (1) some commentary from this confab’s featured task designers, Robert Kaplinsky and Fawn Nguyen. (2) some featured comments from this group here, including Bowen, Mr K, Dan Anderson, Jennifer Potier, Kevin, Katy Engle, and Jason Dyer. (3) a proposed lesson sequence, including an act one video treatment of the Money Duck. You pick any of the ducks you want and get to keep the money inside of it. How much money do you expect to win playing this game one time? I like the angle here, Mike, I’m just curious if a student would say anything other than “$1” or “$5” or “$10” or “$20,” depending on their self-confidence. I have a hard time seeing the answer “$9” pop out of this game. The marketplace idea (proposed by several of you) seems pretty tantalizing and also really tough to pull off. One reservation I have is that at any given moment one half of the class seems not to be doing much of anything which, if true, is a management problem as well as a waste of a bunch of brains. Several of you – Megan, Mr R, etc, and both our featured task designers – want to model the situation beyond expected cash value, looking into cost of soap, days of use, etc. For reasons that are strictly personal and not objective in any way, I’m going to eliminate that complication, going on the guess that expected value is complicated enough without also bringing in the complicated act of mathematical modeling. Could you link up any of those games, Max? This one? No way. And I left a message with the Virginia Candle Company. No return. I’d split the class in half and have half the class discuss one question and then the other half discuss the other. Then I’d have kids share what their groups came up with. I’m wondering how far the students could get with either question without additional support or information or instruction from the teacher. What do you imagine happens during those discussions? What do you imagine happens next? Thanks a mil for putting this in front of kids and reporting back. Your kids have a really fascinating and risk-averse approach to probability. They’re assuming the worst case outcome (however likely it actually is) and pricing accordingly. This means the soap company never makes a profit (if the price and value are both $5) and in cases where the soap company includes a larger bill than $1, the soap company starts losing dough. This kind of problem is so open-ended that you might have to put some constraints on it. Say, in a lot of 200 ducks, how many of each bill would you use? 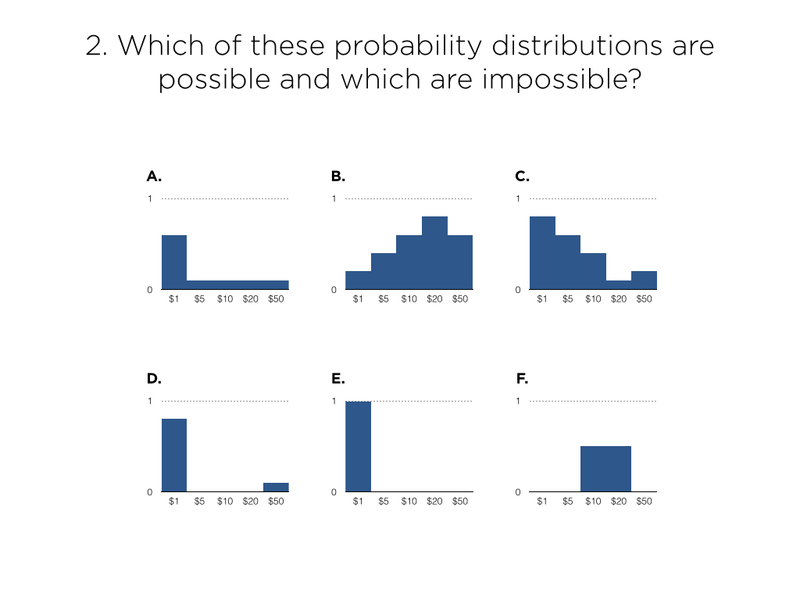 And then ask students to come up with 3 different distributions. One distribution would have to equal $10, the second distribution would have to yield the highest profits for the company, and the third distribution would strike a balance between the two and offer buyers some hope of landing that $20 or $50 (which would encourage more sales). I like the use of contrasting cases there at the end and the recognition that a totally open problem here is going to confuse a lot of students. I’d like to hear more about “let them play with it.” What does that mean? It’d be ideal to formalize their informal understanding of expected value but I’m not sure how the picture of 100 ducks and dollars gets us even to that informal place. Sorry Dan, I couldn’t find the problem I was thinking of. I was remembering a classroom lesson I had observed and I thought it was based on a Math Forum PoW, but looking through the library it seems like they were using a problem from another source and using “I Notice, I Wonder” as the launch activity and that’s what I was there to observe. The problem was something like this: http://www.algebra.com/algebra/homework/Probability-and-statistics/Probability-and-statistics.faq.question.271158.html (I’m sorry it’s such an ugly website). I noticed that your suggested treatment lets students start from their buyer perspective at first, and shifts them towards a seller’s perspective as things get more formal and quantitative, which makes sense to me. I wonder which kids might have more and less trouble making that transition. Movie magic, Max! I only made three purchases. I opened two up and they were both one dollar each. I’m saving the third for a day when I need a pick-me-up. By fading out on the infinite clicky-clicky, I’m trying to push the conversation towards probabilities rather than absolute (and finite) quantities of ducks. From Dan Meyer: “The marketplace idea (proposed by several of you) seems pretty tantalizing and also really tough to pull off. One reservation I have is that at any given moment one half of the class seems not to be doing much of anything which, if true, is a management problem as well as a waste of a bunch of brains…. You’re right. I suppose a bette setup of the marketplace would allow all groups to make their own product, and then allow all the individuals to be the buyers. The most interesting mathematical time would be the initial setup of the product and the breakdown after the marketplace has concluded. I don’t think that there’d be an extended marketplace amount of time, enough to set the flan, but not enough burn it. This might be an efficient and fun way of setting up a marketplace, allow each group to set the odds of each bill appearing, and set a price (they’d need to divulge the probabilities). After the marketplace was setup, then give students a bankroll and allow them to buy bars of soap. What business would make the most money? What buyer would (luckily) get the biggest reward? I think the danger here, like many online forays into the teaching of math, is not letting the computers do _all_ the interesting math. Know what I mean? Lately I’m thinking about a certain kind of faded scaffold where the student manually does something for a stretch after which the computer does it for her, opening up more interesting mathematics. So here, I’m thinking the student needs to calculate profit and loss manually for a bit. For example, your classmate wants to buy your duck for $25. Your classmates opens the duck and there’s a $10 bill inside. What has happened to your bankroll after this interaction? You compute this and manually adjust your bankroll for a stretch but after a time, the computer does it for you freeing you up to attend to limiting behavior and other global foci. Does that keep us on the right side of this marketplace idea? I’m probably coming at this from more of a probability angle (because I’m teaching it right now), but I like the co-mingling of theoretical and experimental probability, represented by the producers and consumers tasks. The producers need to have probabilities that add to 1, and the consumers will potentially grasp that even though the $20 bill should show up once every 10 soap bars, it takes a long long time for the probabilities to play out. Computer simulations are a natural extension to this experimental probability. Yea, and have the students originally keep track of the probabilities and then have the computers take over and track the outcomes. Is this marketplace idea too open ended for a full computer simulation? Totally love the task design – way more structure than my ill-formed ‘let them play with it’. I see you trying to provoke intellectual need for the idea of expected value when you ask kids to pick out what a fair price is for each of the distributions of duck money. Here’s the big thing I wonder here: is there actually a way to get kids to develop the ‘formula’ for expected value?? I think there is, and this would be in your task right after you have kids pick out that initial fair value. Then, summarize with the formula EV=p1v1+p2v2+…pnvn and then let them practice. Right, I don’t believe that.